The 4th Edition of the Consensus is a substantially expanded and updated version of the last edition released almost 10 years ago. Those familiar with the Consensus will immediately notice a new lay-out. While the 3rd edition focused on how to do a medico-legal certificate, the present edition is designed to guide the physician in filling up the medial modules of the Women and Children Protection Management Information System (WCPMIS). 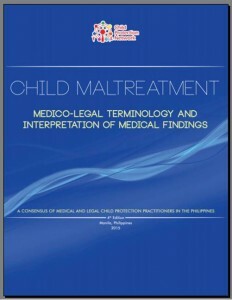 In this edition, the Consensus has evolved into a comprehensive guide that brings together the collective knowledge and experience of medical and legal child protection practitioners in the Philippines for the past ten years. The clinician’s role in promoting socially responsible media coverage of child abuse. The mass media is a powerful tool for public education concerning child abuse and neglect. 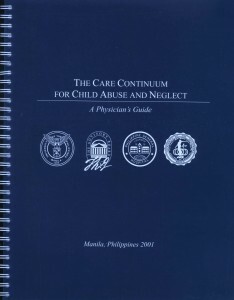 To ensure the continuum of care necessary for abused children, however, physicians must protect the privacy, dignity and self-respect of these traumatized patients. Discrimination Act) and Presidential Decree 603 (Child and Youth Welfare Code) mandate that physicians report suspected cases of child abuse to governmental authorities. 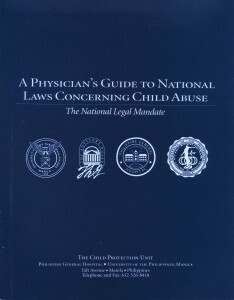 These laws state that the head of any public or private hospital, medical clinic and similar institution, as well as the attending physician and nurse, shall report the examination and/or treatment of any child who appears to have suffered abuse to the appropriate authorities within two days time. Failure to report a possible case of child abuse within 48 hours of the examination is punishable as stated in RA7610 and PD603. RA7610 and PD603 also grant all persons acting in good faith immunity from any liability that may arise as a result of filing a report. Forensic DNA evidence is a powerful tool in criminal investigations. A suspect’s DNA may be compared with DNA recovered from the victim or the crime scene; if the samples match, the suspect has been placed at the scene of the crime. Thus, DNA evidence can either link a suspect to a crime or eliminate him from suspicion. 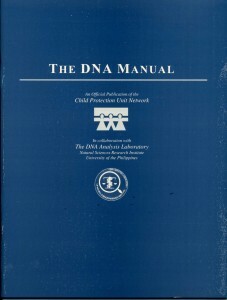 DNA can be especially useful in the investigation of violent crimes, such as child sexual abuse. 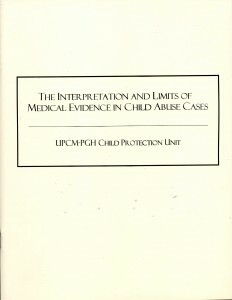 According to Edmund Locard’s Principle of Exchange, “when any two objects come into contact, there is a transfer of material between them.” Because of the intimate nature of child sexual abuse, assailants are likely to leave traces of biological material, either at the crime scene or on the victim specifically. The strength of DNA as evidence, however, is based entirely on the reliability of the process used to collect and analyze it. Each step of the process is essential and must be performed accurately; the most technologically advanced laboratory equipment is useless without proper evidence collection and preservation. Mishandling or human error at any point could destroy the evidence or render it inadmissible.